Our reflective stickers and reflective labels have a strong metallic backed self-adhesive. These reflective vinyl stickers adhere to any smooth, dry surface permanently. We offer customization options for white ink printing and Variable Data printing for barcodes, serialized numbers, consecutive numbering, random numbers, color coding, QR codes and more.All reflective stickers, decals, and labels are cut from the finest materials used in the industry, to ensure high durability and the highest level of visibility possible at all times. Our stickers are digitally printed and cut from DOT-approved 7-year exterior-grade high intensity retro-reflective vinyl, engineering-grade ASTM D 4956-01 Type-I Reflective Vinyl. This high intensity vinyl is a flexible, glass bead retro-reflective vinyl perfect for use at night. Every single piece of our reflective labels, decals, and stickers are 100% DOT and ASTM-rated and approved in all 50 U.S. states, and throughout Canada. At Multicolor Labels, we’re here to make digital label printing easy. Take advantage of our short runs for full colour reflective decals — no need to commit on huge quantities! We encourage low minimum orders for quick turnaround times. 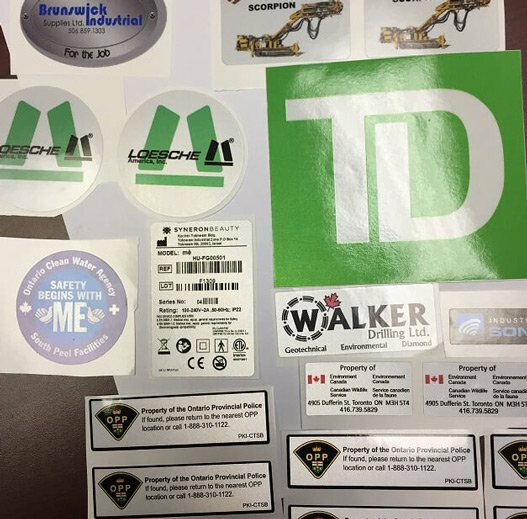 Whether it’s a few hundred reflective stickers or thousands, we’ll help you determine your needs on top of supplying you with personalized service, expert consultation and fair pricing. We’re here to help you increase your company brand awareness with high quality, full-color custom printed reflective stickers. Contact us for more information on our custom quotes and low minimum short runs.